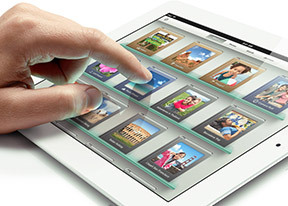 The pivotal feature of the new iPad is the Retina display. Just like with the iPhone, Apple went ahead and doubled the pixel count in both directions. The 1024 x 768 screen of the first two generations made way to the astounding 2048 x 1536 Retina display. The pixel density of 264 ppi is not even close to the iPhone's 330, but still better than any tablet currently on the market. As you would expect the images now appear a lot sharper, the pixels are barely visible even really up close and the tiniest text is still perfectly readable. Note that our (new) iPad uses a warmer (yellowish) color scheme than the colder (bluish) iPad 2. This is an issue present to all iGadgets - depending on the screen manufacturer, each iPhone/iPad has a warm or cold color scheme. Lots of the pros of the iPhone's Retina display carry over here as well - the vibrant colors and the great viewing angles. Interestingly enough, Apple managed to keep almost the same brightness levels as on the previous generation iPad. As a result, the contrast ratio on all three iPad generations is pretty much equal. The new iPad heating issues have been one of the hottest topics in the tablet realm over the past couple of days - opinions range from the heat being intolerable to it's not a big deal. That's why we decided to conduct a few tests ourselves and found out more about it. So here's what we did - we placed the new Apple slate alongside its iPad 2 predecessor and started checking out how the two would react to various challenges. The ambient temperature was just north of 22°C (72°F) and unsurprisingly the two slates weren't any hotter when we woke them up from their sleep. We started the test by turning on the screen and leaving them just sit there idle. Next, we put the CPU under stress - both the A5 inside the iPad 2 and the A5X inside the new iPad have dual-core Cortex-A9 processors, so we expected to see a similar peak in the temperature of the two. Then came the main suspect's turn - the new quad-core GPU was most often quoted as the source of the problematic bit and our tests confirmed that it contributes quite a lot to the high temperature. The EpicCitadel demo was our first testing ground - it doesn't support rendering in the new Retina resolution so the two slates were on even ground. Finally, we let the quad-core GPU unleash its full potential by running Infinity Blade II on the new iPad. About an hour later the new iPad reached 44.4°C(111.9°F) at its hottest point - it's really better if you avoid holding it at the bottom left corner, where the chipset is located. It won't burn you or anything, but it gets really uncomfortable. So, in conclusion the issue does exist and the new iPad really goes a bit hotter than comfortable for holding. The peak temperature of the new slate is, according to our measures 12.7°C (26.1°F) higher than that of its predecessor and that's a pretty major difference that you can easily feel with your hands. It might turn out to be an even bigger deal if you use it in warmer environment than ours or in direct sunlight. For the complete test results head over to our dedicated blog post.